A grading scale allows you to set which letter grade will be awarded based on the percentage grade earned for Term and Yearly grades. You may use traditional letter grades with or without plusses and minuses (A, B, C, D, F), improvement indicators (O, S, I, N), Pass/Fail or any other designation that meets your needs, up to 4 characters per letter grade. you have students of varying levels. Your early elementary students may only need 'Needs Improvement', 'Improving', and 'Outstanding' grade notations while your middle or high school students require more traditional letter grades for their future transcripts. your student is taking classes at different levels. Often an AP course or other advanced class will have a different percentage and/or grade point assigned to each letter grade than a scale used for a regular or at-level course. you want some of your Courses to be graded with letter grades and others as Pass/Fail. You will need to create grading scales to reflect each of those options. The number of scales you create and how you use them is up to you. You may add new scales at any time as your needs change. If you elect to have multiple grading scales, you must use the Course feature of HSTOnline. When an Assignment has a Subject and no Course, the Default Grading Scale will be used to determine letter grades for those items. Again, the Default Scale can be edited to meet your needs. The Grading Scales list is sorted alphabetically by the Name field. You can group or sort by any columns. The Active column shows a 'Y' if the Grading Scale is active and an 'N' if the Grading Scale is archived. Add: Add one or more items to the Grading Scales list. This action is always available. 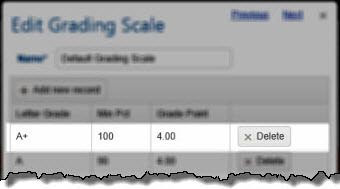 Copy: Copy the details of a selected Grading Scale to quickly generate a new scale. This action is available when one Grading Scale is selected. Edit: With one Grading Scale selected, this action becomes available. Choose edit to make changes the selected Grading Scale name. Multi-Edit: With two or more Grading Scales selected, this action becomes available. Choose this option to edit the 'Include GPA in Transcripts' and/or Active status for all selected items. Delete: With one or more Grading Scales selected, this option becomes available. Choose this option to permanently delete the selected items from your database. Choose Columns: Click or touch this option to select which fields will be displayed in the Grading Scales list. You must select at least one column. 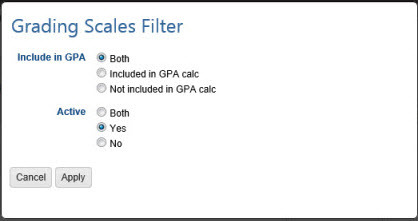 Filter: Click or touch this option to select which types of Grading Scales will be displayed, based on their GPA and/or Active status. Only those items which fit all of the selected categories in the filter will be displayed. 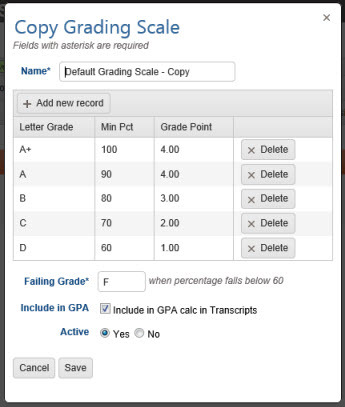 The default selection shows all Active Grading Scales, whether the GPA is being used in Transcripts or not. When anything other than Both is selected for either option, the Filter Settings badges show which types of items are being displayed. Search Box and Go Button: Use the Search box to enter text and click the Go button to find Grading Scale names matching your entry. HSTOnline will do an exact search for whatever text you enter. Leave the search box blank and click Go or click or touch the Search text badge to return to the full list of Grading Scales. Viewing: Indicates the number of Grading Scales being displayed out of the total based on the current settings. Select All: Click or touch this badge to quickly select all the Grading Scales in the list. Selected: When one or more Grading Scales are highlighted, this badge will appear to show the number of items selected. Click or touch this badge to quickly deselect all previously selected Grading Scales. Filter Settings: If you have limited the types of Grading Scales to be displayed, the filter badge will appear showing the types of items being displayed. Search text: Shows the text entered into the Search box which is limiting which Grading Scales are displayed. Click or touch this badge to clear the text from the search box and remove that limitation. 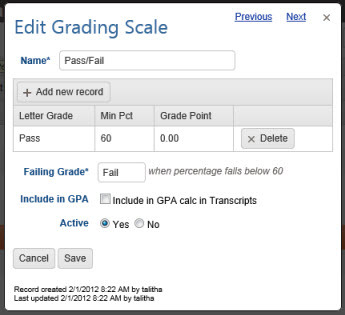 Grading is an optional feature and can be enabled and disabled using via Program Options in the HSTOnline menu. On the Program Options page, click or touch the Grading tab. In the Enable Grading area, click or touch True to enable grading; click or touch False to disable grading. Your HSTOnline database contains a Default Grading Scale. You may edit the Default Grading Scale to change the name and/or the details of this scale. The Failing grade you assign will be applied when the percentage grade falls below whatever you have entered for the lowest minimum percentage for you other letter grades. You may create as many grading scales as you like. Grading Scales other than the Default Grading Scale must be attached to one or more Courses in order for them to be used by HSTOnline. On the HSTOnline menu, click or touch Grading Scales under the 'Manage Lists' section. On the Grading Scales page, click or touch the Action button and choose Add to open the Add Grading Scale Window (Fig 1). Name: Enter a name for your Grading Scale, up to 150 characters. Letter Grade: Enter a letter grade for your scale, up to 4 characters. You can use the traditional A-F scale, you can add a plus or minus sign, or enter whatever symbol you would like. Min Pct: Enter the minimum percentage required to attain that letter grade. This will always be a whole number. In the Grading section of Program Options you can choose to have your grades displayed as whole numbers, or rounded to the nearest tenth or hundredths place. Grade Point: Enter the grade point to be awarded for this letter grade. The Grade Point is an optional field. You will want to use it when creating grading scales to be used by high school students for Transcripts. If you are schooling only elementary or middle school students, you might choose to ignore this field for now. To remove an entry, click or touch the Delete button for that row. Repeat step 4 as needed until you have entered all your letter grades for this scale. 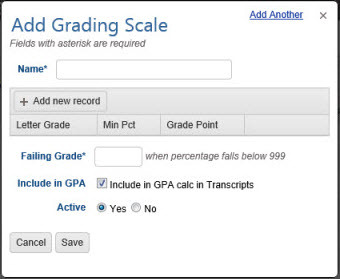 Include in GPA: Check this box if you want the grade points in the grading scale to be included in Transcripts. It is customary that Pass/Fail grades not be included in the GPA calculation. However, that choice is left to you. Active: All new Grading Scales start as Active. Click or touch the No radio button if you want to archive this Grading Scale. You may change the status at any time in the future by editing the Grading Scale. Cancel to abandon the new Grading Scale without adding to your list. Save to add this scale to your list of Grading Scales. The 'Add Another' hyperlink in the top right corner to save this item and add another. You can click 'Add Another' each time until you have entered the last new Grading Scale and then click the Save button to end the Add process. Click or touch the green Added Items notification or refresh the page to see your updated Grading Scales list (Fig 4). If you wish to award just Pass/Fail grades to your student's work you will want to set up a separate Grading Scale, or edit the Default Grading Scale, to award those values. You will still need to enter points possible and points earned into your Assignments, but you can enter simply 1 point possible for these items, and then enter 1 point earned for passed items and 0 points earned for failed items. To create a Pass/Fail scale, follow the directions above to add a new scale, or the edit directions below if you want to adapt the Default Grading Scale to this use. We recommend that you name the scale Pass/Fail or something as easily identifiable. For the Failing Grade, you might want to enter 'Fail' instead of just the letter F. A Pass/Fail scale requires only one entry in the letter grade section. Create an entry for Pass (or P if you prefer) and the minimum percentage required to attain a passing grade. 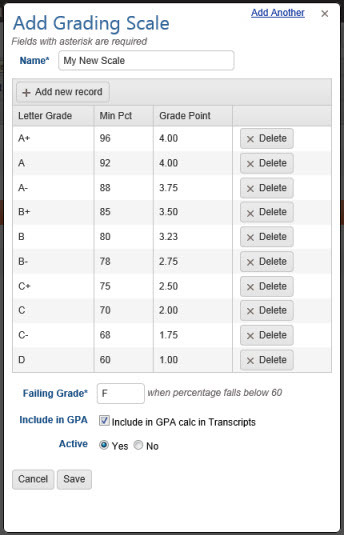 It is customary that Pass/Fail grades not be included in the GPA calculation. 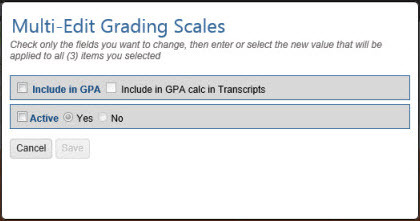 To that end when creating a Pass/Fail grading scale, we recommend that you uncheck the box to 'Include in GPA Calculation in Transcripts, but the choice is up to you. A Grading Scale must be attached to each Course you create. The Default Grading scale is the default selection, but you can change that to any other Grading Scale you have created by selecting a different scale from the drop down list. You can change the designated Grading Scale for a Course at any time, using the Edit Course feature. You may wish to create a new Grading Scale using some information from an existing scale. The Copy feature allows you create a new scale with all the settings of an existing scale. You can then edit the parts of the scale as needed for the new scale. On the Grading Scales page, click or touch the Grading Scale you want to duplicate and then click or touch the Action button and choose Copy. HSTOnline will create a duplicate entry in the database for the selected grading scale. The name of the displayed scale will show the original name followed by '-Copy'. Make whatever changes are needed to the name or other details of the scale. Click or touch the green Added Items notification or refresh the page to see your updated Grading Scales list. 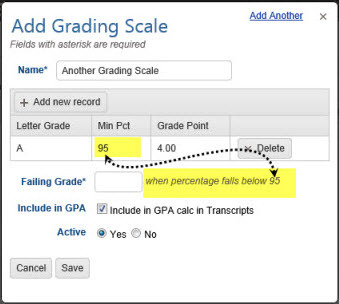 You can edit a single Grading Scale to change any part of that scale: name, failing grade, minimum passing percentage, or any of the letter grade entries belonging to that scale. Any change you make to an existing Grading Scale will change all records attached to that scale past, present and future. If you need to tweak a Grading Scale you might want to consider using the copy function to duplicate the existing scale and then make whatever changes you need going forward. This will preserve your previous records and give you a new scale to use going forward. When editing multiple Grading Scales at the same time, the only fields that can be changed are the 'Include GPA in Transcript' checkbox and Active status. Any change you make to an existing Grading Scale will change all records attached to that scale past, present and future. If you need to tweak a Grading Scale you might want to consider using the copy function to duplicate the existing scale and then make whatever changes you need going forward. This will preserve your previous records and give you a new scale to use going forward. On the Grading Scales page, double-click on the item you want to change to open the Edit Grading Scale window. Alternatively, you can click once on the item you want to change and then click the Action button and choose Edit to open the Edit Grading Scale window. On a touch device, touch the item you wish to edit and then touch the Action button and touch Edit to open the Edit Grading Scale window. You may edit any element of the Grading Scale. Changes made will affect all records attached to that Grading Scale. To add a letter grade to the scale, follow the directions above. To edit the parameters of an existing Letter Grade, click or touch in the Letter Grade, Min Pct or Grade Point field and make the changes needed. To remove an existing Letter Grade, click or touch the Delete button for that line. To change the Active status this Grading Scale, click or touch the Yes radio button to make the Grading Scale Active; click or touch the No radio button to Archive the Grading Scale. Cancel to abandon the changes and close the Edit Grading Scale window. Save to commit the changes to your Grading Scale and close the Edit Grading Scale window. Click or touch the Previous or Next hyperlink in the top right corner to save your changes to this Grading Scale and move to the previous or next Grading Scale in the list. You can click or touch Previous or Next until you have made all the changes you want to your Grading Scales and then click the Save button to end the Edit process. If you reach the beginning or end of the list when clicking or touching Previous or Next, the Edit window will close and you will be returned to the list view. The multi-edit feature allows you to make the same change to two or more Grading Scales at the same time. Use this to change the 'Include GPA' and/or Active status for all of your selected items at once. On the Grading Scales page, select the items you want to change. You can use the Grouping and Sorting, Filter and Search features to isolate the items you want to change. Click or touch the Action button and click or touch Multi-Edit to open the Multi-Edit Grading Scales window. To enable the form, click or touch the box to each field you want to change for all selected Grading Scales. Make your selection for each of those fields. Cancel to abandon the changes and close the Multi-Edit Grading Scales window. Save to commit the changes and close the Multi-Edit Grading Scales window. 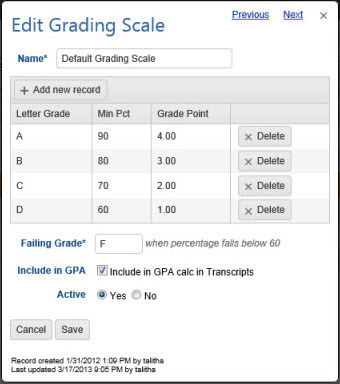 You can delete a Letter Grade from any Grading Scale or any entire Grading Scale other than the Default Grading Scale. Deleted items cannot be retrieved. On the Grading Scales page, click or touch the item you want to remove and then click the Action button and choose Delete to open the Confirm Delete window. Never Mind to cancel the delete process. Yes, I'm Sure to complete the deletion process. 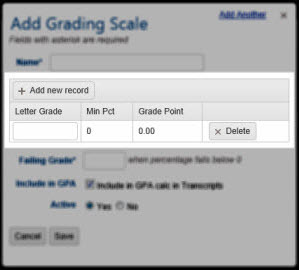 If the Grading Scale is attached to any Course, you will see a message that the selected item cannot be deleted. Click or touch the 'Never Mind' button to return to the Grading Scale List. 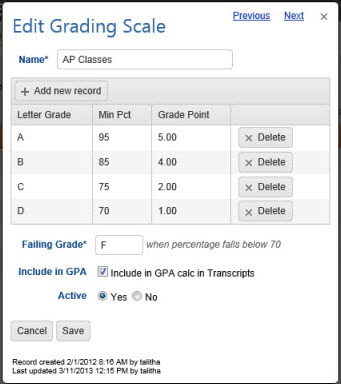 From there you can choose to archive the Grading Scale to hide it from your list. On the Grading Scales page, select the items you want to remove. You can use the Grouping and Sorting, Filter and Search features to isolate the items you want to remove. Click the checkbox for each Grading Scale you want to remove. You can use your mouse to click and drag over contiguous Grading Scales in the list to select those items. On a touch device, you can touch and drag your finger over contiguous Grading Scales in the list to select those items. Click or touch the 'Select All' badge to select all the Grading Scales in the list. Yes, I'm Sure to complete the deletion process. HSTOnline will delete any of the selected Grading Scales which are not attached to any Course. Items that are in use will not be deleted. The exception is the Default Grading Scale - which can never be deleted. When you archive a Grading Scale it will still be attached to any Courses for which it was designated. Archiving the Grading Scale only makes it unavailable to select for other Courses in the future unless and until you choose to reactivate the scale. Use the Edit or Multi-Edit directions above to change the Active status of your Grading Scales.